New Legacy Library Project: Dr. Martin Luther King, Jr. In honor of Black History Month, LibraryThing members are starting a new Legacy Library project, to catalog the personal library of Dr. Martin Luther King, Jr. We’re welcoming everyone to join the fun in cataloging Dr. King’s books! Legacy Libraries are the personal libraries of famous and infamous people and institutions throughout history, cataloged by LibraryThing members. Our first Legacy Library was Thomas Jefferson‘s collection, added in 2007. February being Black History Month got us investigating Dr. King’s library once again (following behind Frederick Douglass’ Legacy Library, cataloged in 2012). Since the last time we looked, better data became available, so now’s the time do do it. 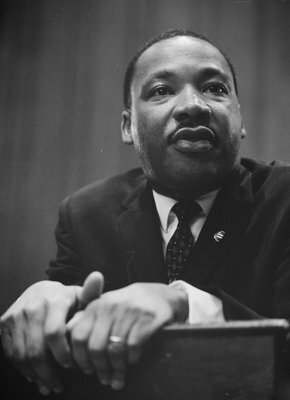 Residing in his alma mater, Morehouse College in Atlanta, Dr. King’s books were saved in 2006 from being auctioned off at Sotheby’s in New York City. Archival staff at the Robert W. Woodruff Library of the Atlanta University Center processed the collection, and now LibraryThing members are working on getting these records (over 600 in total) added to our Legacy Libraries. Check out the Talk thread or jump right to the project Wiki page to get started and claim your section of the library list. If you haven’t worked on a Legacy Library project before, this is a great introduction to them, as the sections are short! LibraryThing member and former LT staffer Jeremy is running the project and can answer any questions you have on the Talk thread. Thanks for joining us, and have fun!